Avoid pinching the ears since they are very sensitive. Best also to avoid pulling on the flap. The hairs surrounding the ear canal are very sensitive also, so try to avoid touching them since the cat will shake the ears if they are brushed. Kitty will shake the head after medication is instilled, so perform the procedure in a bathroom or kitchen so that if medication is shaken out, it does not land on your expensive custom Persian rug. Cats and pills can be tricky. Although some have no trouble with oral medication others will take the pill to the back of the throat, and then quietly go to the next room behind the comfy chair and spit it up. 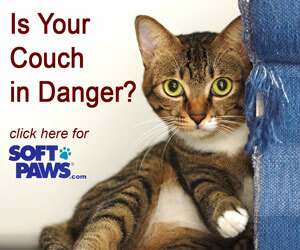 While some cats just might find a distant quiet corner of the home and hide out when treatment time approaches. Liquids may end up more on you, or shaken around the room than in the mouth sometimes. Rinse pills down with a teaspoon of cool tap water. Research has shown that cats do not move pills down their food pipe (esophagus) very effectively, and if they get stuck, it is not only very uncomfortable, it can lead to erosions and ulcers in the esophagus. Another helpful way to get the pills to slide down is to coat them with butter. This is slippery and as a bonus, quite tasty so Kitty may be much more willing to swallow! Some people use peanut butter, but sometimes just like with us, it gets stuck to the roof of the mouth, so is not particularly helpful. Praise kitty for taking her therapy. Cats do not respond to punishment, but do respond well to praise. If she tends to try to run off, wrapping her in a soft bath towel will keep her from using your leg as a springboard for a long distance dive away! An assistant is helpful, so if you have a family member or friend who can help to keep her attention that might be useful. When you grasp the upper jaw of the cat on each side just behind the corner fang (canine) teeth, be firm but not excessive in pressure. This gentle but firm grip will help you steady the head while the other hand opens the mouth by using your finger to gently pull down on the small front teeth (incisors) of the lower jaw. Make sure to have the staff at your hospital review the correct technique first. If Kitty is not cooperative, they may recommend you use a pilling assist which is a plastic tube in which you place the pill. This means your fingers don’t need to go into the mouth to place the pill at the junction of the tongue and the roof of the mouth! This can be a real finger saver… Hold the head steady until you see or feel a little swallow going down the neck. This is your cue that medicine is on the way, and not going to meet you next time you vacuum behind that chair. Do not hold the head up in too extreme a position. If you have ever tried to chug a soda in that position, you will know that a slight head elevation is much easier. Cats are so fastidious that topical treatments end up being carefully groomed out of the coat promptly. Don’t count on wound powders, creams or lotions to stay there for long! If bandages have been applied at the hospital, or topical treatment must be used, frequently an Elizabethan collar or similar structure will be applied to physically interfere with Kitty’s ability to turn around and lick or chew the offending substance off. For certain diseases, injections may need to be given regularly. Insulin injections may need to be given under the skin on a regular schedule, or for a kitty with failing kidneys, fluid treatments under the skin may be prescribed. Make sure you are comfortable with the technique and ask to have the injection demonstrated at least once at hospital. Ideally, do it yourself there and have the trained staff give you feedback on your technique. If fluids are being prescribed for a cat with chronic kidney failure, make sure you carefully warm them to room temperature before administration to avoid cold shock to the tissues around the needle. Always use a fresh needle for each treatment as dull or dirty needles are not a cat’s best friend. Avoid air in the administration line or insulin needle. Offering a treat at the time of injection may keep attention off of your manipulations to the point that a happy cat will not even notice your gentle administration. Remember that cats remember a bad experience like the elephants! Never lose your patience when giving medications. It may take a few extra minutes to take time for praise and attention around treatment time, but this is time well spent to prevent a therapy-shy kitty!